It seems that the Street Fighting Years tour was originally going to visit America in October 1989. 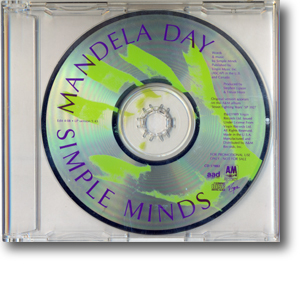 This would explain why A&M decided to release Mandela Day as a potential new Simple Minds single the same month. However, the visit to the USA was cancelled, probably due to the lacklustre interest in Street Fighting Years. It must have been a late cancellation as A&M had already embarked on a marketing campaign for the new single. Trade adverts appeared in the music press whilst a promotional two track CD was issued to radio stations and music press. It was obvious that the potential single had not been fleshed out. The adverts featured a picture of Mandela, a brief biography and a snippet of the song's lyrics; the promotional CDs featured the "hand" artwork from This Is Your Land, two versions of Mandela Day and nothing more. However, this last Street Fighting Years era release by A&M became popular with collectors as it was the only source of the slightly shorter version of the title song.